Just as his significant other, Angelina Jolie, shaped her career to fit her steadily blossoming maternal instincts at home, Brad Pitt is slowly beginning to find himself in the strenuous role of Dad on the big screen, especially after his largely underappreciated performance in 2006's Babel. 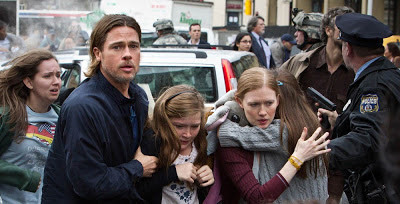 But in his newest film, WORLD WAR Z, his paternal role goes further than the traditional one--he must rescue Mother Earth and her children from the clutches of an inexplicable and urgent global pandemic. And apparently he's the only one who can do this. In WORLD WAR Z, Pitt stars as Gerry Lane, a former United Nations employee in Philadelphia who's abandoned his post for a more low-pressure existence flipping pancakes for his two tweenage girls (played by Sterling Jerins and Abigail Cosgrove). It is a typical day when we meet him, breakfast-time at home with the girls, which includes his wife, Karin (Mireille Enos). With hopeful smiles we see them next in a car waiting in gridlocked traffic. No one on the street knows what's going on until this immense panic erupts. Cars slam into one another and people flee aimlessly away from their vehicles. 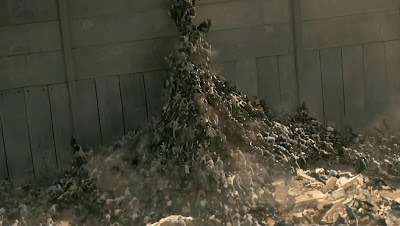 Then the Lane family witnesses what's driven everyone batty--a dizzying crowd of lifeless souls leaping, no flying, from one area to the next attacking victims in a horrifying mass assault before they can even take in what is happening. With a quick visual summation of what has occurred, Gerry grabs his family and heads away from this scene. It is a frightening scene to watch, one that starts out wonderfully calm then shifts into an intense state of frenzy and manic action. Director Marc Forster brilliantly captures the dramatic shift in the film's brutal first few moments. Amid this frightening series of events, the audience is wondering, along with the characters, what is going on. WORLD WAR Z presents the world is in a very nascent stage of infection where panic rules and there are no answers. As a result, no one knows how to react to it, except the Lane family, who emerge from the disaster into an abandoned apartment complex in New Jersey. It is that moment when we realize that we're about to see a very generic man saves the world using his big strong hands kind of film. This is unfortunate because with a title like this, one would expect an epic political upheaval merely marked by this sci-fi subsistence. But it isn't. Though the blockbuster feel is effective and is overwhelmingly gripping at times, the film shifts yet again with a wrench-like addition to the script--Gerry is left no choice but to go back into the field for this inevitable last mission, leaving his family in a government-managed shelter with other unaffected survivors. Though Gerry is clueless at first in regards to the origin of the nightmare they're facing, when he meets the other men who have been working on the case for some time (they brief him on several similar and equally baffling cases), he is somehow the only one who could manage to stay alive after a relatively mild attack on the way to their aircraft, yards away from where they stood. These casualties also include a physician who doesn't die by being bitten, but by slipping and falling flat on his face inches from the plane. If the suspense of the scene wasn't so stressful to endure, this could almost be considered comic relief. But, whatever, we've seen a man saves world movie before. What's the problem with this one, you ask? Well, it's not necessarily a problem, per se, but a fascinating note. Gerry gets word that Jerusalem (popularly regarded as the holiest city in Jewish tradition) may have the drop on this lethal nuisance and has been beating it at its own game by obstructing walls of defense to keep these....things....out of the city (note: from what I recall the word "zombie" is never uttered in the film, though, with the exception of them being able to fly and move very quickly, these beings look exactly like those you'd see on an episode of "The Walking Dead"). Notably, Jerusalem has been known for its several walls built for the same purpose more than five hundred years ago. The historical/spiritual references in the movie deepen when it is Gerry, there only a few hours and admits he is not a doctor, who notices a few startling instances that will later contribute to his winning diagnosis of the epidemic. It's interesting that, despite the fact that leaders of the country have been able to protect the land for years, Gerry's arrival set in motion a series of events that destroyed their defense and crippled them. With a world sinking into destruction at its every corner, Gerry is the one who essentially becomes its new founding father, one who offers it the hope of rebuilding its own ruins and becoming a Promised Land again. But aside from its obvious spiritual nature, much of which is never explored in depth despite a fascinating angle, the film--much like The Purge--chooses to neglect its rather provocative/controversial themes and focus on being a suspenseful horror flick. 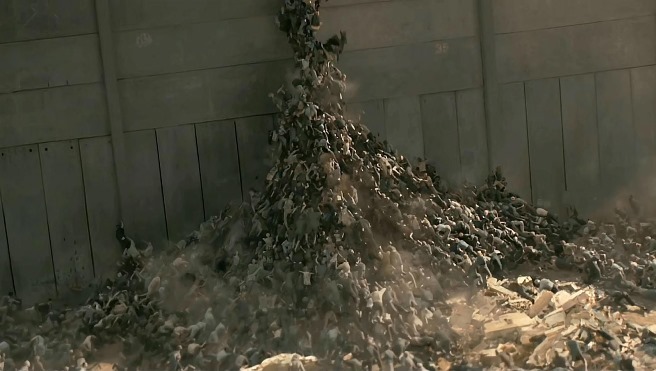 In the case of WORLD WAR Z, this may be a result of several reported script changes that may have led to an extravagant tug-of-war plot between its three screenwriters (Matthew Michael Carnahan, Drew Goddard and Damon Lindelof). Beyond that, the film doesn't ever seem to reach globally, despite its location stamps. The culture and tension of every scene remains the same. In fact, with the exception of the subtle changes in attire, each location just seems like different areas within the United States (and Jerusalem). It doesn't seem like this apocalypse is affecting everyone on a grand scale. For that, it loses some of its tumult, despite its high impact scenes in the few locations we see. 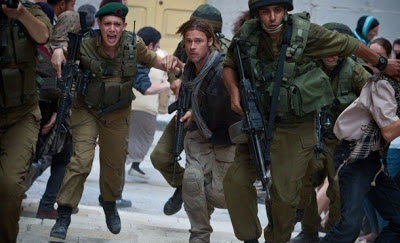 Though his performance doesn't reach the emotional depth of his portrayal in Babel, Pitt does manage to carry the film and rouse the audience in its most formidable scenes. But I'd remiss if I didn't mention the subtle yet significant gravitas Enos was able to bring to her smaller role. As a woman who spends most of the film on a separate continent from her husband, she communicates via a feeble military phone, desperately clinging to every strand of hope she can find. 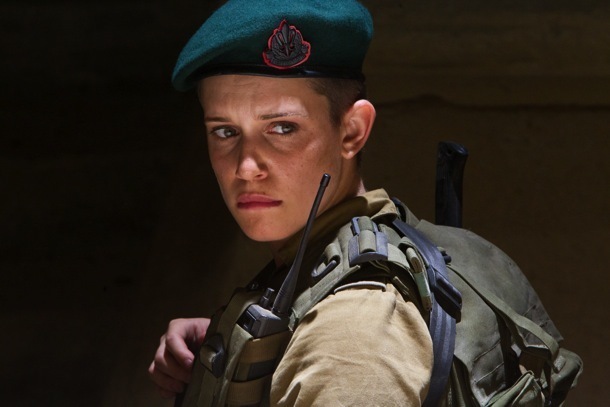 And Israeli actress Daniella Kertesz, who plays military fighter Segen who teams with Gerry in the film, supplies it with appropriate Sigourney Weaver-like power blended with sensitivity. The performance marks an impressive one for Kertesz, who made her full length feature debut with the role. The film leaves the story wide open for a sequel, which will inevitably happen if the box office receipts pile up. While the 3D effect helped increase the intensity of the film, I can only hope a sequel will fill in some of the story that is dangling in some areas. Sounds pretty much like what I expected. After hearing all the issues during the productions I was very worried mainly because the book is one of the more cerebral approaches to the subject matter. The book, which I highly recommend, broaches all sides of this as real event, taking its mark from Katrina, 9-11 and other disasters, and plays them out to their logical conclusion on a global geopolitical scale. I’m going to watch this trying to ignore the title and take it for what it is, another summer blockbuster which is exactly what it sounds like.